Being long and narrow the state consists of the eastern, middle and western Tennessee sections. The Spanish had three major explorers into the Tennessee region. In 1540 was Hernando de Soto. Next arrived Tristan de Luna in 1559 and then Juan Pardo in 1567. The Native Indians they found were the Muscogee and Yuchi tribes. AS the English claimed lands in the 1600s along the coast of American many tribes from there moved into the Tennessee region. The Cherokee arrived along with the Chickasaw and Choctaw. The first British settlement in the Tennessee region was the building of Fort Loudoun. It became the westernmost English outpost in 1756. In the 1760s, American frontiersmen from Virginia explored much of East and Middle Tennessee. Looking at Tennessee genealogy, it is noted the first permanent European settlers of English and Scots-Irish ancestry began arriving late in the 1760s from the eastern colonies, especially Virginia and Pennsylvania. With the American Revolutionary War a success by the 1780s, more migrates headed for the Tennessee frontier. The far western section of North Carolina, in what would later become eastern Tennessee, had enough people by the late 1780s to declare statehood. The region would be known as the State of Franklin. It was not approved for official statehood by the United States government, it was just shy of two votes. Unable to support themselves on their own over the months, the group became part of North Carolina again. Eventually joining with the middle and western sectors of the Southeast Territory, the state of Tennessee was admitted on June 1, 1796. In the 19th century, nearly 17,000 Cherokees, along with some 2,000 black slaves owned by Cherokees were forced out of Eastern Tennessee by the U.S. military to march to the new Indian territory west of Arkansas region. This made available more lands for new settlers. With the start of the American Civil War, Tennessee also seceded from the Union in June 1861. During the war many battles were fought on Tennessee soil, most won by Union forces. Many enslaved African -Americans escaped to Union lines to gain freedom without waiting for official action. Tennessee did not suffer as badly as some of the other southern states after the war. In 1865 some 104 Welsh families moved from Pennsylvania to Eastern Tennessee. They settled in an area now known as Mechanicsville and around Knoxville. Joining the Welsh families were brothers Joseph and David Richards to work in a rolling mill then co-owned by John H. Jones. The Richards brothers co-founded the Knoxville Iron Works beside the L & N Railroad. The Welsh families became successful and established other businesses in Knoxville, including the building of coal cars, slate roofing materials, a marble and furniture companies. By the 1930s many Welsh dispersed into other sections of the city and neighboring counties such Seville. In 1900, African-Americans made up nearly 24 percent of the state’s population, and numbered 480,430 citizens living mostly in the central and western parts of the state. The state’s overall population when from 105,600 in 1800 to 1 million in 1850. Tennessee reached 2 million residents by 1900. In 2009 the state has 6.2 million citizens. 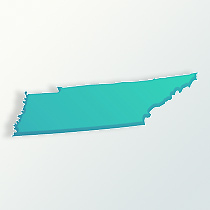 For understanding Tennessee genealogy, also during the late 20th century Tennessee had an influx of people relocating from several northern states, as well as California and Florida. This was due to the low cost of living, and the booming healthcare and automobile industries. Tennessee’s industries include agriculture, manufacturing and tourism, especially because of the Great Smoky Mountains. Crops of soybeans, cotton and tobacco along with major manufacturing exports of chemicals, transportation equipment and electrical equipment. The population of the state is made up of about 26 percent of English and Scots-Irish heritage. Those of African-American are 16 percent and the Irish represent 9 percent. Those who had emigrated from Pennsylvania were mostly German, making them at 8 percent of the state’s population. A growing Hispanic population makes up 2.8 percent of the state. Six Native Indian tribes still reside in the state. About 39 percent of the Tennessee’s people are of the Baptist faith.